Our Good Friday meeting this year is at 7pm in the Kerith Centre, and I really want to encourage you to come along if you possibly can, as well as inviting friends neighbours and relatives to what is going to be a powerful time of reflection. We're going to do the meeting 'in the round', which basically means there will be a stage in the middle of the ground floor of the auditorium, with bean bags and chairs set up all around the stage. Hopefully that is going to give it a very intimate feel as we reflect on the revolution which began as a result of Jesus death on the cross. 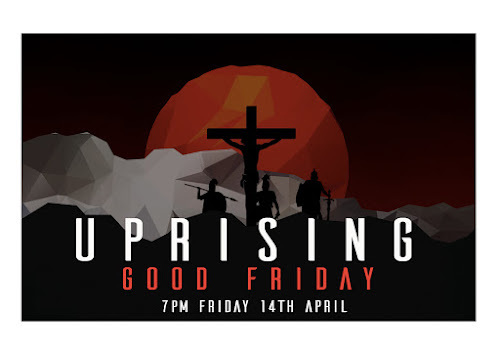 The meeting will include readings from the Easter story, worship, communion, a performance song and a preach. Parking is in the college. The meeting starts with readings so please be sure to get there early and find your space as you won't want to miss the start.